After a year’s absence, I returned to Monrovia on Christmas Day. Since I had been away, Ebola had struck, here in Liberia and in Sierra Leone and Guinea, in the worst epidemic of the disease in history. At first I saw only small, surface differences. You rarely see the once common exuberant greetings. In fact, people don’t even shake hands and embracing is taboo. Then there is the frequent washing of hands with chlorinated water. Otherwise life seemed actually the same. True, many people are without work. There is also a lack of money to buy things. But even before the crisis, 8 out of ten people had no work. Life has become hard, but it was always hard. The country was still struggling to emerge from a brutal 14 year long civil war even before Ebola’s arrival. 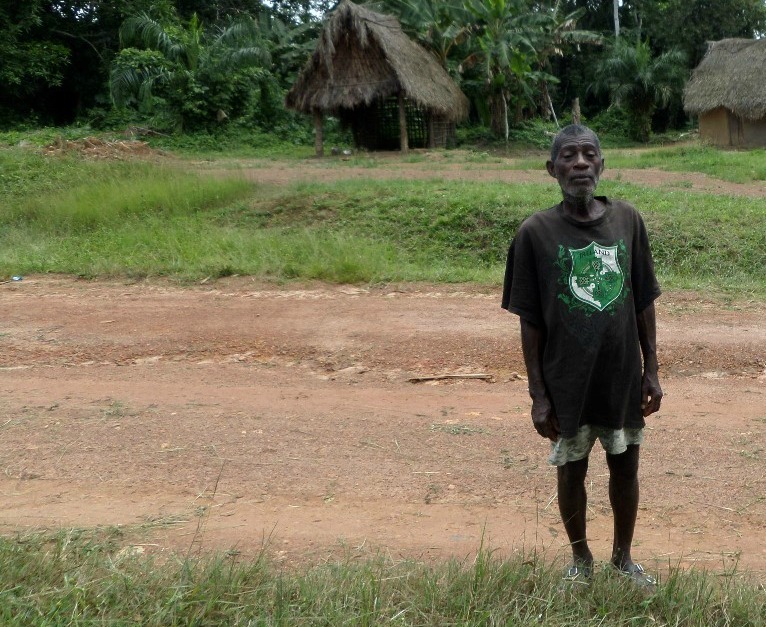 The devastating reality of the epidemic hits you when you visit rural villages first hit by Ebola. In Bong County, the Catholic Church has been the only institution able to reach into the most remote areas. Church volunteers don’t stop when the path becomes impassable. They walk for hours until they reach the most extreme corners. Talking to the communities there, the scale and impact of Ebola comes home. Charles Rennie has buried 38 friends, family and neighbours single handed in the village of Bella Kartala in Bong County. 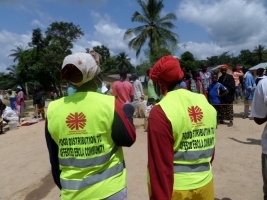 The village was the first to be hit by Ebola in the county. He didn’t have any of the protective clothing and gloves, so buried them with his bare hands. Now he faces the suspicion of the village. They are afraid he either has Ebola or is protected by dark forces. Caritas Liberia is working with the villagers and Charles Rennie to provide counseling and trauma support. Sarah is the daughter of the first victim of Ebola in the village. Her mother, a midwife, became infected when helping a woman give birth in a next door village. The mother, the midwife and the baby all died. Nobody knew about Ebola at the time. In Sarah’s house, eight people died. Then all the furniture was burned and the house disinfected. Sarah now takes care of her little sister. There are thousands of stories of victims and survivors. At the height of the crisis, people just waited for death to come. They stayed in church, distraught and with no idea how to save themselves. It was from the priests and catechists that they learned about Ebola. During the first 15 minutes of the Mass, they would explain what the disease was and what to do to protect yourself. There in church, first hope was restored. Ebola’s legacy in Liberia will be long lasting and hard to predict. 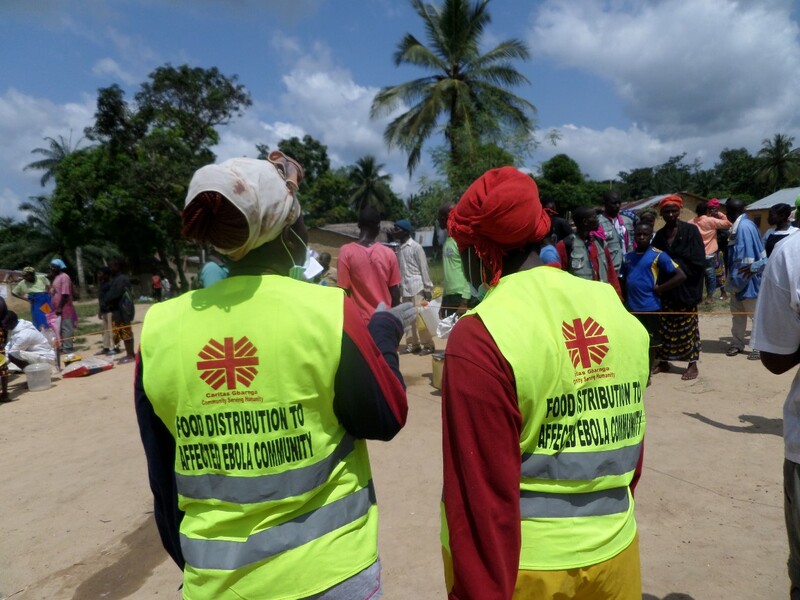 As Caritas was delivering food aid to the village, a heavily pregnant woman went into labour as she waited in line. 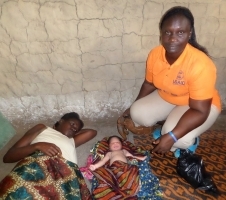 Caritas staff helped her deliver the baby. The infant is called Ebola. Back in the capital Monrovia, the Cordaid (Caritas Netherlands) supported football teams, the Waikiki boys and girls teams, were on the field again. Players and fans all had to be thermo-gun tested before being allowed on the bus to the game. The girls play a combination of soccer and baseball called Kickball. They won 17-8. In front of a big home crowd, the boys put two goals past Mount Barclay FC, who were unable to reply. The players went home happy with their victory. Now they must look to pay their school fees. The re-opening of schools has been postponed for a few weeks, partly to enable schools to set up their Ebola prevention systems and partly to give parents more time to get money to pay the fees.